Radio Spirits is pleased to present 20 classic episodes of Suspense, one of radio's longest running and best mystery anthology series. This collection features programs from the early 1950s as produced and directed by Elliott Lewis. 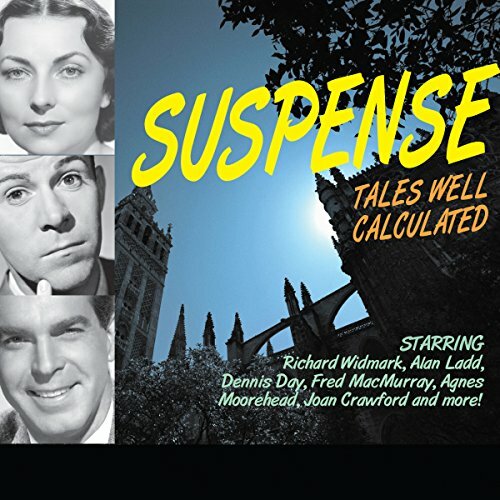 Suspense was well known for its guest star performers and the shows presented here are no exception, featuring appearances by Dana Andrews, Joseph Cotton, Richard Widmark, Ozzie and Harriet Nelson, Alan Ladd, Dennis Day, Fred MacMurray, Agnes Moorehead, William Bendix, Ronald Colman, Joan Crawford, Phil Harris and Alice Faye, Deborah Kerr and more. We invite you to once more experience "tales well calculated to keep you in...Suspense!" The programs in this collection have been digitally remastered and restored for your listening enjoyment. Episodes Included: Over the Bounding Main 09-14-50; The Crowd 9-21-50; Fly by Night 09-28-50; The Rose Garden 10-05-50; Too Hot to Live 10-26-50; Going, Going Gone 11-23-50; A Killing in Abilene 12-14-50; Christmas for Carol 12-21-50; The Windy City Six 02-08-51; The Death Parade 02-15-51; The Gift of Jumbo Brannigan 03-01-51; A Vision of Death 03-08-51; Three Lethal Words 03-22-51; Death on My Hands 05-10-51; The Case for Dr. Singer 06-28-51; The Report of the Jolly Dead Riders 08-27-51; The Evil of Adelaide Winters 09-10-51; The Hunting of Bob Lee 10-29-51; Rogue Male 12-31-51; Lady Pamela 03-31-52. 2008 - RSPT LLC. All Rights Reserved. Audio programming is manufactured under exclusive license from series rights holders. Unauthoritzed duplication prohibited.